Bill O'Reilly's new series, Legends and Lies, is an interesting show depicting characters from America's past--showing what legend says and what is actually true. I've found several of the shows to be quite informative and intriguing, as well as learning things about several Old West figures that I hadn't known before. I won't go into those here, as you may have watched many of the episodes yourself, but I thought it might be fun to investigate a few myths vs truths about Old West characters. Truth truly can be stranger than fiction, as the saying goes-but it can also be more boring. Many characters in the Old West are infused with a romance they don't deserve. While cowboys were colorful, they often endured somewhat mundane lives, living in a drab, cramped bunkhouse for low wages. They worked from daylight until dinnertime, and sometimes until sundown. Women were few and far between in many areas of the Old West, so it was rare that a cowboy won a woman in a swoon-worthy romance. Sometimes they ventured into the Native American lands or Old Mexico for their spouses, as so few single white women ventured out alone. However, it's true that there were mail-order brides who traveled out once trains and stagecoaches started regular runs to the Western part of the U.S., supplying comfort and wives for many a lonely man. 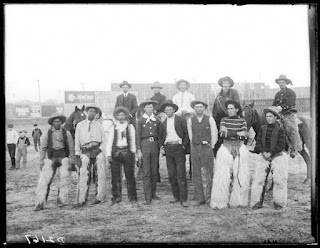 Most dime novels and legends talk almost exclusively about young white men, with little notice given to older cowboys, African American or Native America cowboys (later, after the Indian wars ended) or Mexican cowboys, all of which existed. More Native Americans worked for the Army than they did as cowboys, but they weren't only on the warpath against whites, as is often depicted. 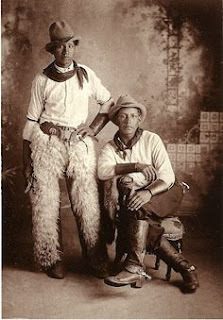 There were dozens of different cultures and countries represented among the American cowboys. Legend shows that horses were pretty much the entire mode of transportation (including pulling buggies and wagons)--but did you know that camels were also prevalent in Texas at one time? The Southwest United States used to be home to hundreds of feral camels—and it was all thanks to our meddling government. 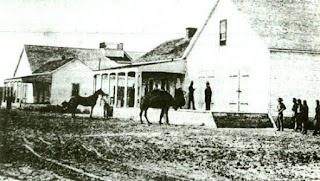 In 1855, congressed assigned $30,000 for the buying and shipping of camels from Egypt. The idea was that dromedaries would fare better in the scorching Southwest than horses, making long survey missions easier. By 1857, the army had seventy camels and early experiments were looking good—and then civil war broke out. In the melee that followed, camels managed to escape into the wild where they did what any other wild animal does, and bred like crazy. For nearly 100 years, feral camels were a part of Texas’ wildlife, with the last sighting reported in 1941. That’s right: in your grandparents’ lifetime, the United States was home to wild camels. Another myth/legend is that there were shoot-outs on nearly every street corner at any given time. However, that's not true. Did you know that several towns, the famous Tombstone included, had laws that people must check in their guns with the sheriff when they arrived in town, and could pick them up when they departed? That's one of the reasons for the shoot-out at the OK Corral. Wyatt Earp was trying to enforce that law. So what myths or legends have you heard or learned over the years, or what strange facts about the Old West piqued your interest? I'd love to hear them. Who knows, they might even make their way into my next book. 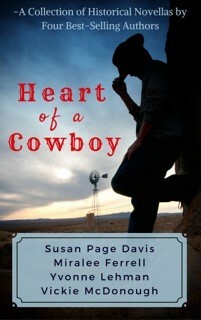 Heart of a Cowboy--A collection of four new historical romance novellas by best-selling, multi-published authors, Miralee Ferrell, Susan Page Davis, Vickie McDonough, and Yvonne Lehman. Don't miss this one--it's for sale on Amazon OR you can read it FREE if you subscribe to Kindle Unlimited. Miralee Ferrell and her husband, Allen, live on eleven acres in the beautiful Columbia River Gorge in southern Washington State, where they love to garden, play with their dogs, take walks, and go on research trips. She is also able to combine two other passions—horseback riding and spending time with her grown children—since her married daughter lives nearby, and they often ride together on the wooded trails near their home. She's a best-selling (having achieved that distinction with three books now), award-winning author of both historical and contemporary romance, as well as middle-grade kids' horse novels. You can learn more about her or her books at the following places. I can't think of any myths or legends.....interesting post, though. Thanks so much, I'm glad you enjoyed it~!